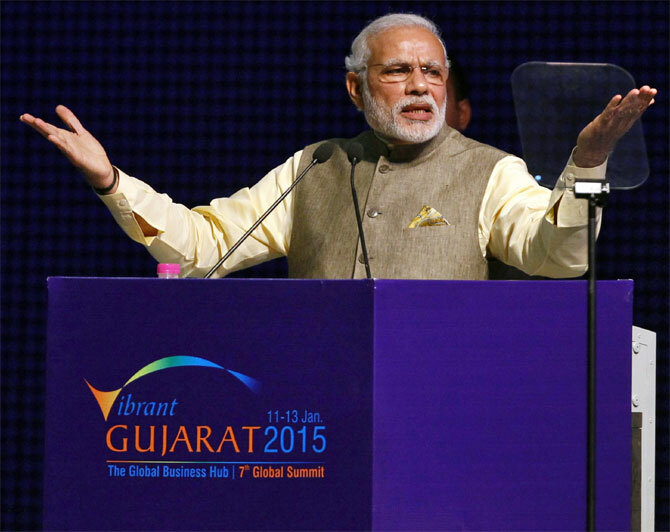 Rediff.com » Business » Vibrant Gujarat: Do the numbers add up? 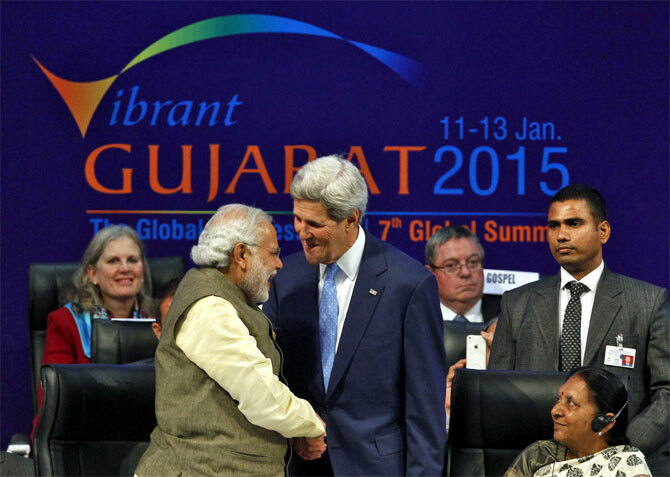 Vibrant Gujarat: Do the numbers add up? The Vibrant Gujarat summit, which has been fondly referred to as "Davos in Action" by Prime Minister Narendra Modi and “a magnificent affair” by Finance Minister Arun Jaitley, has drawn to a seemingly spectacular conclusion. This year, the state government proudly announced the investment commitments that it had managed to attract from corporates during the summit, a whopping Rs 25 lakh crore ($402 billion). From 2003 to 2011, the investment figures have continually soared; from a 'modest' Rs 66,000 crore ($10 billion) in the maiden year to an eye-popping Rs 20.83 lakh crore ($335 billion) in 2011, the only aberration being 2013. The cumulative figure (between 2003 to 2013) standing at Rs 51 lakh crore ($821 billion). This year it has managed to beat its best figures; the PM himself canvassing for the summit, helped. These figures had propelled Modi from being just the CM of an Indian state, to being the 'hope' that the country had to 'rescue' itself from decades of 'policy paralysis'. As financial journalists, we regularly quote figures. At times figures don't make real sense, until they are put in some perspective. For a contrast to the irrational exuberance after each biannual summit in Gandhinagar, let's see how much foreign direct investment (FDI) the entire country has managed to attract between 2000 to 2013. According to data from the department of Industrial Policy and Promotions (DIPP), between April 2000 and March 2013, the cumulative amount of FDI equity inflows for India stood at Rs 8.96 lakh crore. Well, one would argue, Vibrant Gujarat investment commitments, not only include FDI, but also domestic investments. Let's look at it, slightly differently then. Data from the DIPP further shows that the number of investment proposals in terms of Industrial Entrepreneurs Memorandum (IEMs) and Letter of Intent or (LOIs) in Gujarat has declined from 544 in 2011 to 354 in 2013, down by around 35 per cent. The proposed investment through these investment intentions have also commensurately come down, from Rs 1.42 lakh crore ($22 billion) to Rs 94,259 crore ($15 billion) in 2013, a dip of 33 per cent. For that matter, if one compares the investment proposals received by the state during 2014 (up to July) with the same period in 2013, it shows a decline from 223 proposals in 2013 to 205 proposals in 2014, and a 64 per cent dip in investment commitments from Rs 61,842 crore ($9.96 billion) to Rs 21,979 crore ($3.53 billion). The tall claims that the state administration, particularly Modi's highly charged PR machinery has created to hardsell the state, and in turn Modi himself, are not reinforced by the numbers. Image-building works though. It can generate quotes like "Vibrant Gujarat made the whole world vibrate with dynamism" from even United Nations secretary general, Ban Ki-moon. Even Modi himself has been conscious about the investment figures at the summit. His government had refrained from disclosing the numbers (perhaps to avoid criticism) at the 2013 summit (when according to media reports the summit received investment intentions of about Rs 12 lakh crore ($193 billion). Local speculation was that the numbers were not released because the drop ahead of the Lok Sabha elections of 2014 would have dented the Gujarat Model. The 2015 Vibrant Summit, however, was all about inclusive growth, or so they said from the dais. Figures like investment intentions worth Rs 2 lakh crore ($32 billion) would create at least 50,000 jobs were doing the rounds on the very first day of the summit. Do the maths: these must be the most capital intensive factories in the country at Rs 4 crore ($644,485) investment to create one job. If the state is attracting so much of investments, no one in Gujarat including the semi-skilled blue collar worker, should be unemployed. There is a twist here as well. According to Planning Commission data, absolute employment in Gujarat had actually dipped from 25.3 million in 2004 to 24.65 million in 2009 (the years when the Vibrant hype was at its peak). No wonder, Modi called the Commission an old house that cannot be repaired. 10 words you probably didn't know existed! Quiz Time: Who was the original choice for Aamir Khan's role in Dil Chahta Hai?